Pitcher plants are the type of carnivorous plant that sits and waits for bugs to fall into their pitcher traps. The tendril-shaped “pitchers” have a rim on the top that stops insects from climbing out once they get in. Generally, pitcher plants do not require much maintenance, but pruning a pitcher plant occasionally produces a more vigorous plant. Read on to learn how to prune a pitcher plant. If you are wondering when to prune pitcher plants, understand that trimming pitcher plants is not a daily or weekly task. In fact, pitcher plants can go for a long time without requiring a pruning. Sometimes, however, pruning a pitcher plant will increase its vigor and create a fuller plant, and these are the pitcher plant pruning opportunities you want to take advantage of. First, if your pitcher plant blooms, you should prune off the blossoms of a pitcher plant when they wilt, just as you deadhead other plants. This type of pitcher plant pruning is easy. You simply use a pair of garden scissors to cut off the stalk of the bloom at its base. If your pitcher plant has yellow or brown foliage, that part of the plant is dead. Trimming a pitcher plant to remove dead foliage is not difficult. You simply snip off the dead leaf at the point where it meets the stem of the plant. If you are wondering how to prune a pitcher plant when only a part of a leaf is yellow, like the leaf tip, follow these instructions. Use the scissor to cut the foliage just below the yellow part so that only the green part is left on the plant. The partial leaf can still do its job absorbing sunlight for the plant. If your pitcher plant has developed long foliage that looks untidy, pitcher plant pruning is in order. 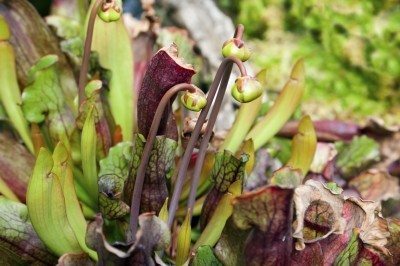 To tidy up messy plants, start trimming pitcher plants back with the scissors. Prune back each stem to a reasonable length. If the plant is old and uncared for, it will accept severe pruning. Pruning a pitcher plant encourages new growth to form. If your pitcher plant is a tropical plant known as Nepenthes, or Monkey Cup, you may wonder about pitcher plant pruning for this species. Essentially, the instructions are the same. As pitchers and leaves die back naturally, trim them off to keep the plant vigorous. Prune back the green vine stems to encourage side shoots to grow.